Pest Solutions 365 recommends using a full-perimeter treatment using an approved termiticide to properly protect your home from additional termite infestation or damage. A complete barrier must be formed around the entire home to provide the maximum protection from termites. The slightest opening in that barrier will subject your home to further infestation and damage if termites are in the area. Termites can forage up to half an acre looking for food sources, so it’s imperative that treatment be done correctly. When treating termites conventionally with rodding and trenching, Pest Solutions 365 follows the label of the termiticide being used. 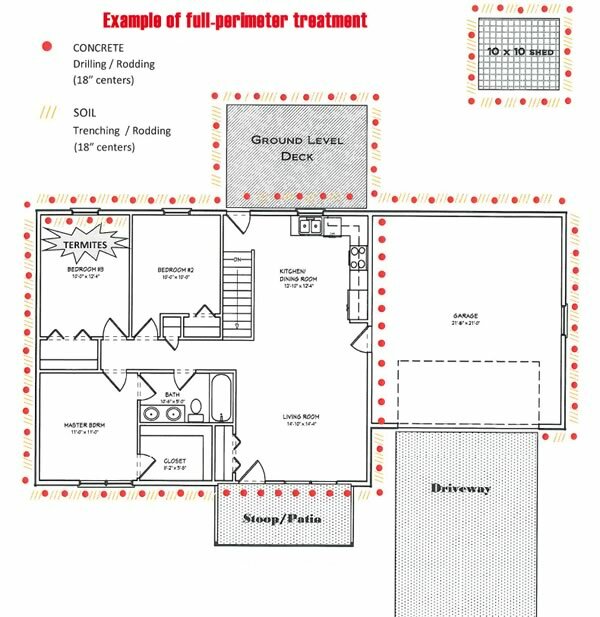 To provide a complete treatment zone (barrier) around the home with termiticide, we accommodate for the physical obstructions around the perimeter of the home, such as concrete, vegetation, stoops, and decks, so the termiticide being used gets properly applied along the home’s entire foundation. In order for termiticide to be applied where concrete butts up against the home’s foundation, it must be drilled on 12- to 18-inch centers, with each hole rodded with termiticide to the prescribed depth noted on the label. Rod tips are designed to spray termiticide 14 inches in a 360-degree pattern along the foundation, creating a 2- to 4-inch overlap. Concrete stoops or porches should be drilled on 12- to 18-inch centers, with each hole rodded with termiticide as described above. If the stoop or porch is excavated, we will then treat around the obstruction vs. pumping termiticide into the home’s basement. If a deck is an obstruction and it sits too low to allow access to drill/rod the area below it, Pest Solutions 365 will make every effort to remove the decking material immediately adjacent to the home’s foundation so we can drill/rod the soil below. Pest Solutions 365 will make a trench along the foundation so we can rod the area on 12- to 18-inch centers. This allows the termiticide to pool in the trench as each subsequent hole is created, eventually being absorbed in the soil adjacent to the home’s foundation. If your home’s foundation receives a properly applied full-perimeter treatment, it should be protected from termites for a minimum of five years. Note: In the event that a homeowner does NOT want their decking removed or drilled, the Nebraska Deptartment of Agriculture does give applicators the option of entering into a written agreement. Both parties state that they recognize the need for treatment, but the property owner grants permission to the applicator, or agrees in principle, that the untreated area is not protected from termite invasion and therefore the treatment is NOT covered by the warranty. If this is the case, the NDA would expect the written agreement between the property owner and the applicator to become a part of the pesticide application of record.